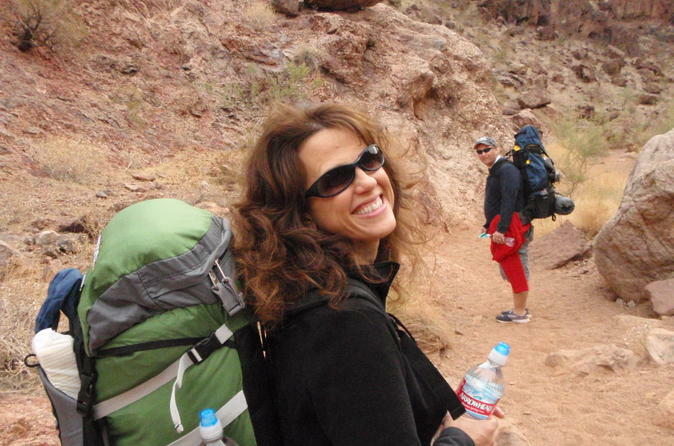 Join this hike through the Black Canyon and travel south along the Colorado River on the White Rock Canyon trail to the Arizona hot springs. Soak in the hot springs, enjoy a light lunch and hike back to the trailhead. Round-trip transportation from Las Vegas and bottled water is included. Just a short drive out of Las Vegas and past Hoover Dam is Arizona! Start from Black Canyon and hike around boulders scattered through a beautiful slot canyon, and enjoy the shade of White Rock Canyon walls while you hike. Along the way your tour guide will also point out ancient rock art from Mohave and Paiute tribes. At first, you may wonder why this trail is called White Rock Canyon when the canyon walls are mostly red, but you will find that more and more the rock around you becomes granitic, or mostly white. A geologic marvel! Toward the hot springs, the trail offers a great view of the Colorado River, but this is not the only water you'll see. Your next stop is the hot springs! Here you'll soak in the hot springs, enjoy a light lunch and then hike back to the trailhead. This hike is a wonderful desert adventure you won't soon forget!